Wavemakers is a relatively obscure make of modular and integrated synthesizers made in the 1970s and early 1980s by Dr. Terry Kincaid. 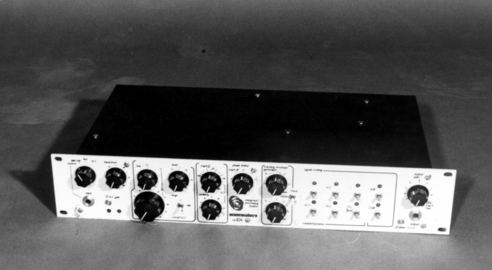 Wavemakers also produced a line of rack effects, a mixer and sequencers. Wavemakers was a mobile operation, beginning in Ann Arbor, Michigan, later moving to Edmonds, Washington. The company began in 1970 around the University of Michigan, creating custom modules for the university and area musicians. 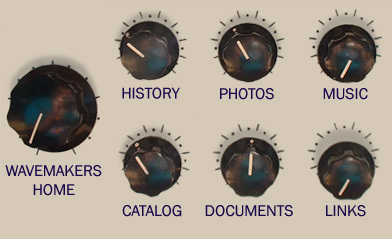 These were large format modulars with varied size control knobs and 1/4 inch jacks. The first generation modular panel sizes were 10 inches high with widths of 2, 4, 6, and 8 inches. Often these panels had multiple integrated module blocks, such as the 245 Quad VCA module with four VCAs and integrated panning, or the 308 Triple Bandpass Filter with three multimode filters. Early panels were a deceptively neutral color, at times described as cream, silver, gray, or light blue. Both small and moderate sized cabinets were built for these modules, ranging in size from single unit high by 8" wide to larger double height cabinets. 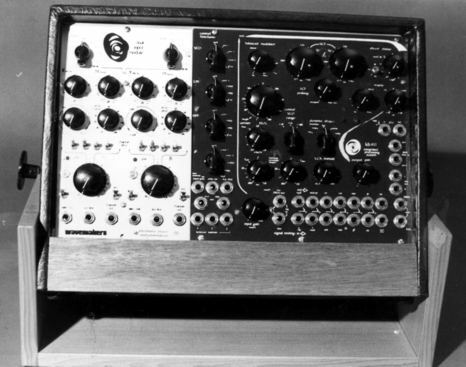 Later systems such as the Wavemaker 4, 858 Series Mixing System and Wavemaker 6 were all a deep rich anodized blue, rather than the painted panels of the earlier modular. Some of the early modules were replaced with newer modules, such as the 100, 105 and 201 VCO with the 108 VCO and the 444 Dual Envelope Generator and Step Control Source with the 238 Dual Delayed Envelope Generator. Interest in the instruments broadened nationwide according to a NAMM publicity handout, leading to a line of rack effects in the mid 1970s, the Wavemaker 4 semi-modular synthesizer around 1977, an unusual 8x4 Quad Mixer around 1978, and the Wavemaker 6 or 600 in 1980. The modular system continued to be sold until at least 1980 along with the newer designs. Despite this, Wavemakers appeared to be a one or two person operation and never achieved the publicity or volumes of Moog, Arp, Emu, EML or even Buchla. Total estimated synthesizers shipped is estimated to be between 20 and 100 units. Despite the format the designs appear to be very un-Moog-like. Some unusual ideas are presented such as lap (scanner/crossfader) circuits, switched capacitor filters and quad panning circuits. Earlier modules were completely patchable but had some patch over hard wire capability where preset signal paths could be wired. These connections were often made through toggle or rotary switches. Wavemakers moved more and more in this direction as the years progressed. In the Wavemaker 4, every connection has a default signal path but could be over-ridden by plugging into the patch points. Wavemakers coined the term "integrated synthesizer" for these systems. By the time of the Wavemakers 6, complete voice modules were being designed with few access points but with flexible internal routing. In addition to the standard offerings, Wavemakers offered custom designs. For composer Barton McLean they designed a custom Quad VCA module with slew limiters and envelope followers. Usually these custom units used inexpensive labeling such as Dymo labels or adhesive mylar. For another customer Terry designed a waveshaper that transformed a sine wave from a Heathkit oscillator into square and sawtooth waveforms.
" Always obsessed with instruments and imaginations of what could be, I became aware of Wavemakers around 1979 or 1980. By that time I was still selling and building Serge systems and still involved with a variety of events and organizations around Los Angeles. I was beginning to get work in the film world. I can't remember the exact details of how it came about but the short version is that I was the one who took Wavemakers to the NAMM show. I met Terry Kincaid after talking with him over the phone and we hit it off. I saw great potential in his designs. He always seemed like a slightly confused genius to me, sort of an "absent minded professor" and I really wanted to see his designs succeed. He only lacked marketing savy. I remember making a trip to Terry's home in Edmunds with two friends after several phone calls. We eventually nailed down a plan of action to get his instruments into the limelight. I was involved in laying out the Wavemaker 6 and with the marketing campaign for his whole line. We also had great hopes for the mixer and maybe even scoring some modular sales to any institutional types who might be there. Along with the help of one of Terry's long-time customer/friends who lived in Los Gatos we organized a booth, built up an inventory of instruments and hauled it all down to Anahiem. I had been working NAMM shows for years at this point and knew the ropes pretty well. We did press releases, brochures everything short of the ubiquitous demo band - hoping to concentrate on the small and obscure but dedicated synthesizer freaks who haunt that event." " As I recall we got the most interest from the press goons. They seemed to think these odd, modular looking beasts were quaint, sort of an early manifestation of the much later "vintage synthesizer" craze. We didn't make a single sale and it was clear by the end that we had really missed the mark: Terry's instruments were NOT what the NAMM world was looking for. We continued to try to sell Terry's designs for a while but it was not to be." " I should have known better. I remember from my many conversations with the repair techs at Roland US that over 80% of the Jupiters and Juno's and the like which came in for repair never had their factory presets tampered with. The world of electronic music was quickly absorbed by the hoards of set-it-and-forget-it keyboard players who never seemed to learn the difference between a piano and a synthesizer. Something as versatile as the Wavemaker 4 was simply WAY beyond their abilities or even their interest." As with all other modular synth manufacturers with the exception of Serge, Wavemakers appears to have disappeared by the early 1980s. The last known appearance in print was a product announcement for the Wavemakers 6 in Polyphony magazine July/August 1980. A few other devices followed, such as a polyphonic controller, table top sequencer, preset programmer and programmable equalizers, but these were the last devices known to have been publicized by Wavemakers. 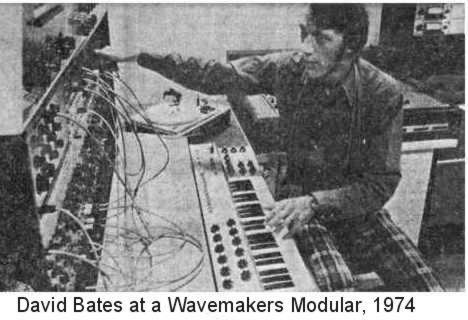 Wavemakers was the brand of synthesizers and electronic music equipment created by "kb electronic music instrumentation," initially a collaborative effort between Terry Kincaid and David Bates. Their company officially started in 1970 and continued until the early 1980s. David S. Bates was born in Ohio on June 21, 1936. He began musical studies on the trumpet in 1945. David Bates was also fascinated with electronics since he was a kid, wiring up door bells and building electric trains. Bachelor and Master of Music degrees were granted by the University of Michigan in 1958 and 1960 respectively. In 1959 he won first prize in the BMI Young Composers' Awards for the compositions "Solo Violin Sonata" and the "Fantasy for Violin and Piano." After a stint in the US Army and teaching fellowships, he became an instructor in Music Theory. Additional awards, fellowships and assistant conductor status followed. In 1970 he co-founded kb electronic music instrumentation, an enterprise concerned with the development and construction of devices used for electronic music composition. He earned his Doctorate in Music in 1971 from the University of Michigan. From there he moved to the west coast as an assistant professor of composition and theory, and Electronic Music Studio director . In 1974 he was awarded the Prix de Rome fellowship. After a short while he was compelled by illness to return to the US where he died from cancer on November 6, 1974. Memorial performances and radio broadcasts of his works followed, as well as a fund to preserve the Bates musical legacy. David Bates was a prolific composer, accomplishing over 40 works in his lifetime. Most of his pieces were for traditional instruments, with a specialty in choral and chamber works. Bates used modern composing techniques for his eclectic music: chance, serial writing and intuition,. About his music he said the following: "If I had to describe my music, I'd say first of all it is romantic. There's no getting around that I'm very much influenced by 19th century composers…I write music for myself: where I stand, my own emotional and intellectual interests. I neither apologize for that, nor flaunt it. It's just what I do." He also said, "Writing music is like solving an exciting mystery. That was Beethoven's genius: his skill in unfolding his music - the lines, the ideas, the excitement, the energy." "SST" was his only purely electronic work. 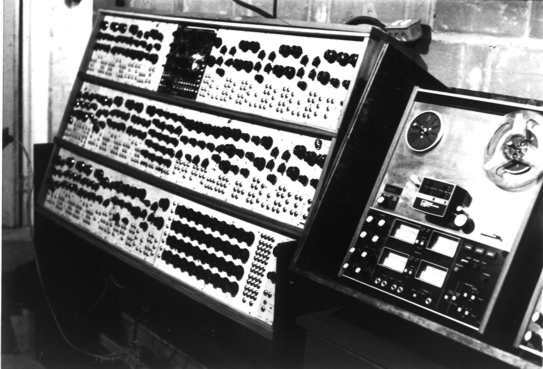 It was realized at the University of Michigan Electronic Studio in 1970. It was heard all over the United States, and received much success in Europe, South America, Japan and Australia. David didn't believe that pre-electronic music was doomed to obsolescence: "It's only natural for composers to look for new ways, to hope that there's something more than synthesizing existing sounds. But the violin is hundreds of years old and it still excites some of the most advanced composers." About electronic music, he had the following to say: "Composers were interested in electronic music because traditional instruments were not capable of doing what the composer wanted done. Traditional instruments could not produce the sounds desired by the composer, whereas electronic music can do anything you want it to." David Bates said: "The future of the electronic instrument is here at the present. Its time has arrived. It is accepted academically and economically. Many rock groups use electronic devices, it is part of the pop scene." Terrence (Terry) Trevor Kincaid was born in Pueblo Colorado on July 31, 1945 and died February 1995. He was the grandson of noted zoologist Trevor Kincaid, and the great grandson of a professional musician. Terry Kincaid received his bachelor's degree in music from the University of Washington. Upon being awarded a Fullbright scholarship, which allowed him to study anywhere in the world at no expense, he chose the University of Michigan because of their leading electronic music program. At the time, the mid-to-late 1960s, Terry considered this the most advanced electronic music program in the world. The University of Michigan campus and area were a hotbed of activity at the time, with musicians such as Gordon Mumma, Robert Ashley and Roger Reynolds coming from this environment. In 1968, just two years before Terry began selling synthesizer modules, he was given the BMI student composer award. This was a significant achievement, and one he shared with the likes of John Adams, William Albright, Dominick Argento, William Bolcolm, George Crumb, Alvin Curran, Mario Davidovsky, Charles Dodge, Philip Glass, Larry Polansky, Daria Semegen and Charles Wuorinen, all of whom were significant contributors to early electronic or avant garde music. Terry was developing a notation system at the time, designed as a universal electronic music notation system that could be played by anyone with a synthesizer and a knowledge of the language. 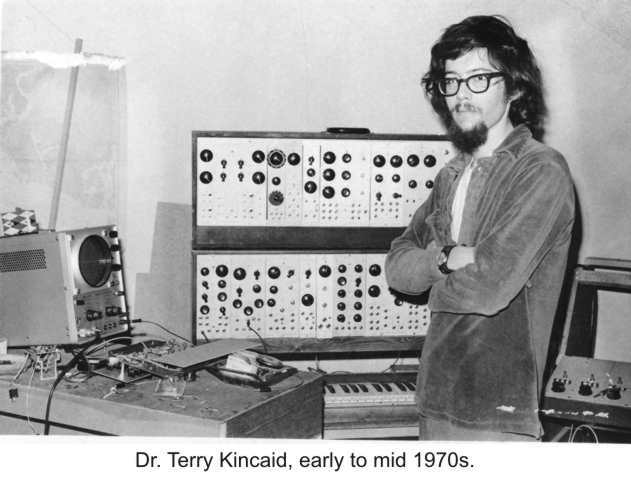 Terry's doctoral thesis was a synthesizer performance composed with several of his fellow students. Terry received his Doctorate in Music from the University of Michigan. 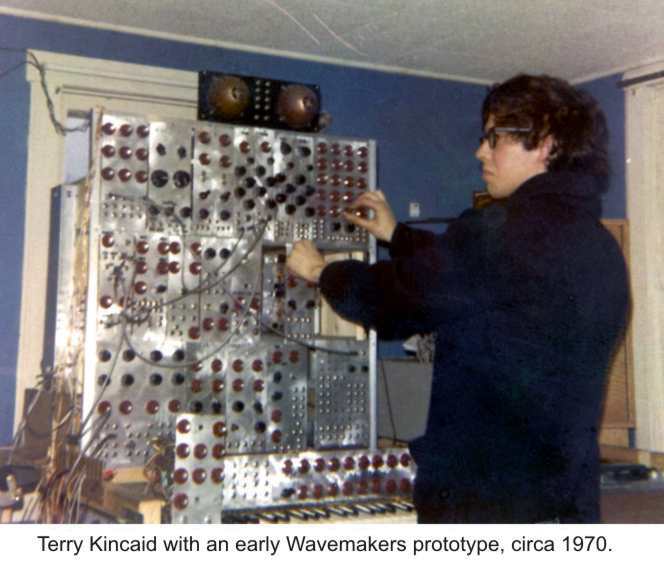 The synthesizer business had an official start in 1970, when Terry was just 24 or 25. In the early days Terry Kincaid had a small apartment in Ann Arbor. One friend describes this as a "Wizard of Oz" type experience, walking into a small apartment with a huge synthesizer sitting in the middle of it. This huge assemblage of gleaming equipment was four or five layers tall and populated with Terry's creations. 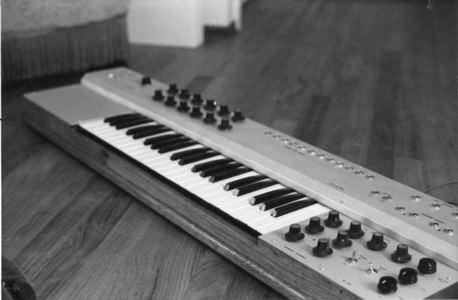 Later Terry moved into a small house in the suburbs with David Bates, where each had their own huge synthesizer for composing. The rest of the apartment looked like a synthesizer construction workroom, with strange functioning equipment here and there. Terry and David would keep the blinds drawn all day and all night, which seemed a bit odd but may have helped them concentrate on their studies. After this Terry moved into a house with his wife and the synthesizer equipment and laboratory moved to the basement. Basically kb electronic music instrumentation headquarters was wherever Terry moved. The move back to Washington state occurred in the mid 1970s. Terry ran Wavemakers as a successful business for over 10 years, in a period where there were very few outlets for advertising or publicizing such instruments. Terry Kincaid has been described as a unique individual and a genius by people who knew him well. Though his degrees were in music, he taught himself electronics well enough to make synthesizers that were competitive with contemporaries such as Moog and Arp. Terry even taught himself German so he could converse with German customers. In his later years he built computers from scratch. Terry's own music was firmly in the avant garde tradition, and often went without melody, harmony or a recognizable beat. When asked why he didn't write music like Bach or Beethoven, he answered that music in that format had already been brought to perfection, and he wanted to explore the outer fringes of sound. Terry was an accomplished sailor and a skilled artist. He was also an artisan in wood, metal and plastics, which he developed building his Wavemakers, but also used to create objects that were both beautiful and useful. 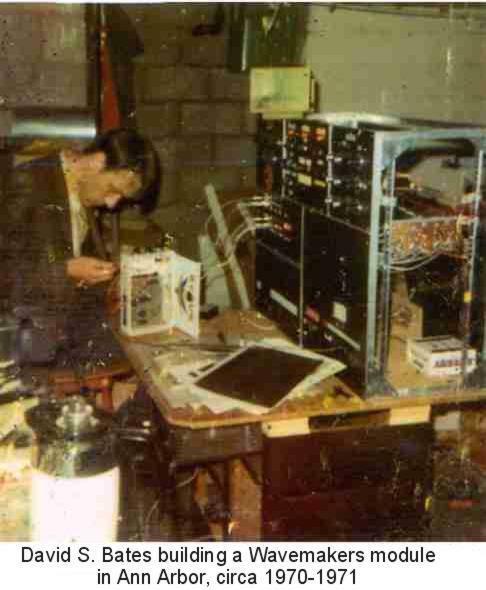 In the 1980s Terry taught himself about computers and became a very adept programmer, mostly to improve his synthesizers but also to support family business. Since computer memory was expensive in those days he prided himself on writing very spare programs. After Terry could no longer sustain his family with the synthesizer business he began working with a software company in Seattle, first by writing programs for them, then later as telephone support, working out of his house. Terry died unexpectedly of pneumonia in February 1995. Hard working to a fault, he was on the phone that very day helping customers of the software company that he worked for, and tragically considered himself too busy to go to the hospital for medical help. Barton McLean recalls an anecdote about Rick Petersen's "Natural Causes," a piece of music accomplished on the Wavemaker 4. Barton sent it to Terry Kincaid, who was deeply moved. Terry sent a letter back saying that after hearing Rick's piece he realized why he worked so hard at developing new instruments. David S. Bates passed away in 1974 and Terry Kincaid passed away in 1995, but their Wavemakers instruments leave a legacy that is just now being rediscovered.